​Why choose a kayak tour? A kayak offers us the opportunity to get close to nature, whilst also being eco-friendly. While you are on a guided tour you are in control of your own craft, this gives you the freedom to explore with a guide never far away. As you sit comfortably in your kayak, watching the world go by or gazing into the stars, you will find there are few things more relaxing. Kayaking is an activity for all ages, whatever your level of fitness. As it’s not a weight bearing exercise very little stress is placed on bad backs or knees. ​Do I need kayaking experience? No previous experience is needed to join our tours. Our kayaks are extremely stable and easy to use. Your guide will give you a few pointers before the tour starts; all you need to know in order to control your own boat. It’s easy, we promise! The short answer is... No. We provide all necessary waterproof gear and the kayaks are extremely stable. Wear something comfortable, we recommend clothes that you would be happy to hike in. If it is cold wear a jumper and feel free to bring a hat. Soft soled shoes like trainers are ideal. We would encourage you to book at least one day in advance to give you the best chance of joining our tours. If you want to book on a tour today, give us a call and we will do our best to help. You can pay on arrival with cash or card. Please note that card payments will incur a 3% surcharge. ​What’s included in the price? A unique and unforgettable tour that will help you escape and relax. 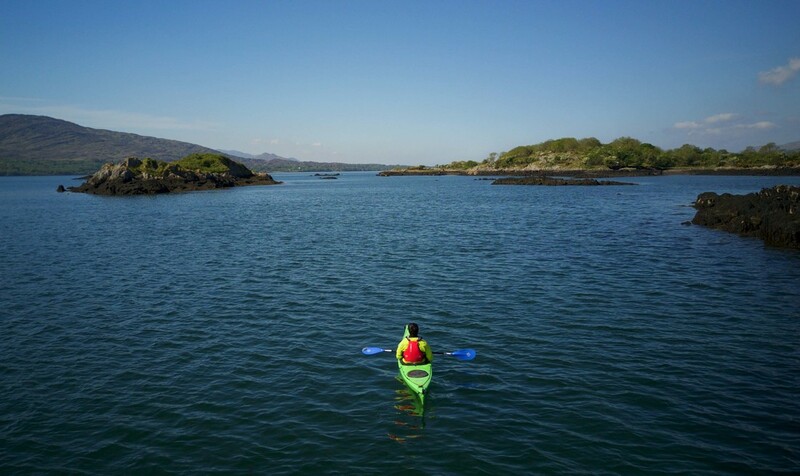 Total immersion in the magnificent and unspoilt scenery of the Wild Atlantic Way. We are able to cater for many different groups and wherever possible will accommodate custom requests. ​How long does a tour last? You should allow approximately 2.5-3 hours from your time of arrival to departure. The only type of weather that will affect your trip is strong winds. Rain, no problem! We love to kayak in the rain here in Ireland. We provide you with fully waterproof kit to go over your clothes and keep you dry and warm. In the unfortunate event that strong winds force us to cancel a trip we will let you know as soon as possible and offer you priority booking on another tour. ​Where do we start and finish? Tours will start at Templenoe pier or Kenmare pier (weather dependant). We will advise you of the start point the day before your tour. We may be able to help organise a taxi to Templenoe if required (between 10-15 euros for up to 4 people). can i bring a camera? We have no problem with you bringing a camera/phone however we don't take any responsibility for it. We would hate for you to drop it into the water but if you’re happy to take it we are happy to pose for photos.